This week I have been finishing up a commissioned rope bed similar to the one I made for my wife and I a few years ago. I usually tell folks that building by hand is just as fast or almost as fast when building one item of furniture. Long rip cuts in 12/4 hardwood are an exception. 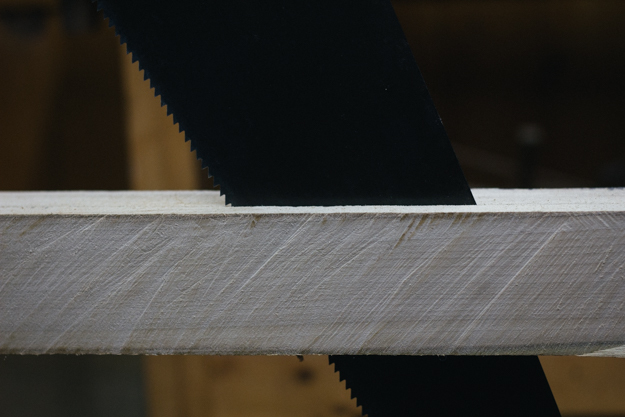 At 19 strokes per inch for 84” of length that makes 1,596 saw strokes per rail. I’m not gonna lie: a tablesaw would have cut these faster. So as I was sawing the third rail, my mind began drifting and, probably because of my level of caffeination, I began getting impatient and bored. The silence of the shop (I don’t play the radio or music in my shop) and the repetitive nature of the sawing motion got me thinking. I remembered the research of Bennett Konesni on the tradition of singing worksongs. My introduction to Bennett’s research was at the Common Ground Fair 2014. Don and Carolyn Williams were up visiting our family and we all went to the Fair (which Don affectionately calls “hippie fest”). At some point during the day we decided to split ways by gender (and interest). Don and I bee lined for the woodworking and traditional craft folks. In our wandering we stumbled across a large circle of people bellowing hearty acapella music. When we got there, we discovered a timber framer hewing a log into a beam. 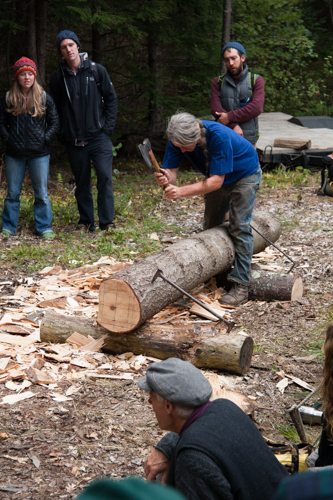 The axe provided the rhythm and the singing reciprocally inspired the hewing. I’d never seen anything like it. Fortunately, our family has been singing the psalms in our daily family worship time so I had a few tunes to pick from. 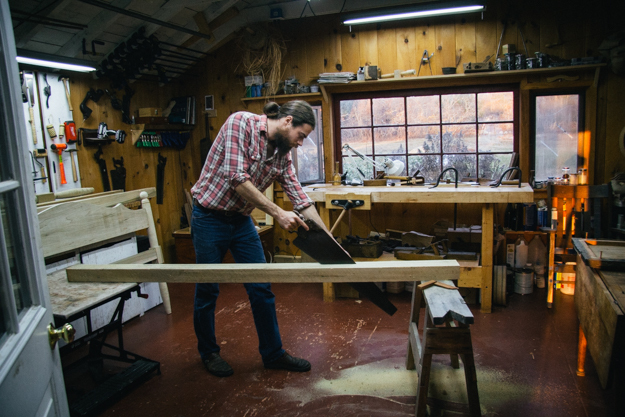 It was an ironic scene: Me, alone in my shop, handsawing three inch thick hardwood while belting out Psalm 1 from the 1650 Scottish Psalter to the rhythm of the saw strokes. To top it off, when I forgot some of the words, I pulled up the Scottish Psalter on my smart phone to help. What a scene. You know what, though? That 25 minutes of 1,500 strokes went by really fast. I thoroughly enjoyed myself. So next time you have a monotonous task, turn off the radio blather to warm up your voice. Don't be shy. Sing your heart out. Sounds good. Try WUMB, here in Boston they play nice mix of folk /american music. Fantastic! I often work to music, either sung or canned. It defiantly helps. I wish Bennet would get back to me about some work songs that have a good rhythm for morticing by hand. Bang, bang, rest , rest. Thanks for this reminder it made me smile and remember the sea chantys that my sister taught me after her semester at sea. Likewise, deck work, raising anchor, hauling sheets on a ship goes lots easier and focuses the work of a few or many....get a bunch of newbs on board that have never worked together, and they can raise a yard in no time when singing (or working to someone singing....). The idea of working and singing is an OLD one.